The structure itself may be cute. The concept is anything but. Kotite—who also runs SheShedLiving.com as a gathering space for like-minded women, and sells a line of paints called She Shades—discovered she sheds herself only a few years ago when book publishers, The Quarto Group, asked her to research the subject. She had been a magazine editor for a number of years, with a strong interest in Victorian homes and interior design. Since outbuildings were a common feature of Victorian homes, she seemed a logical choice. 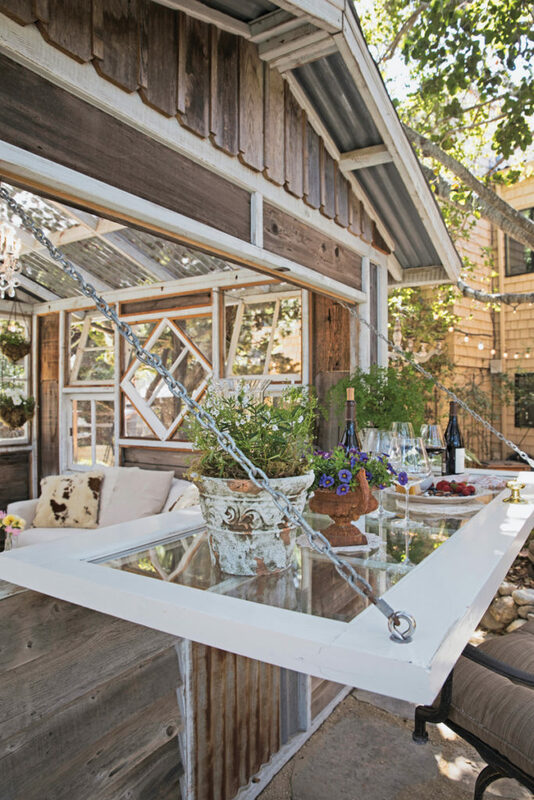 What she learned was that while she sheds are attractive additions to backyard landscaping, and can add to property values, they are really about a woman’s need for a private place to call her own. Kotite’s first book served as an introduction to the whole concept of she sheds. 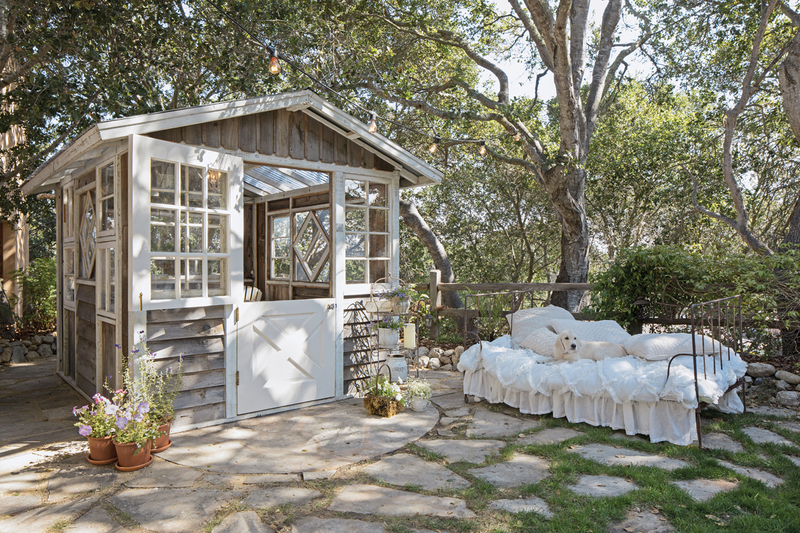 The new She Sheds Style provides guidance for those who want to build one. Why build a she shed? 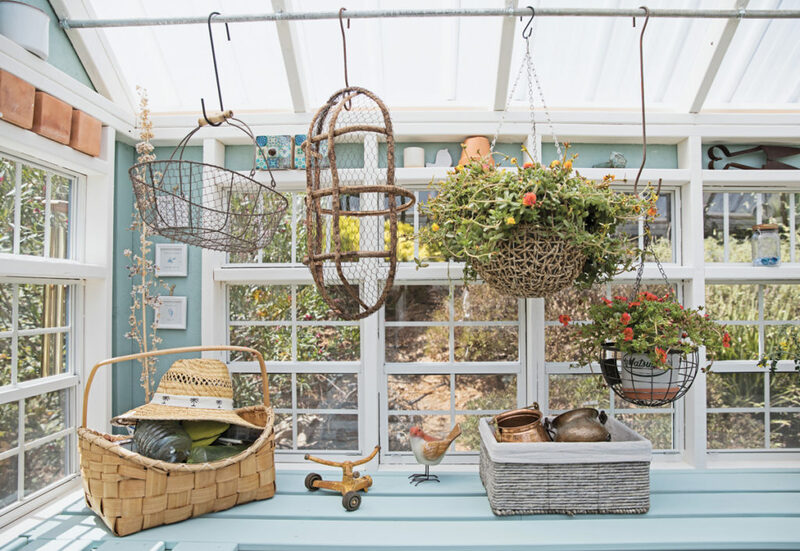 While it may seem that the she shed movement began as a reaction to the “man cave,” they actually have their roots in the old potting shed. 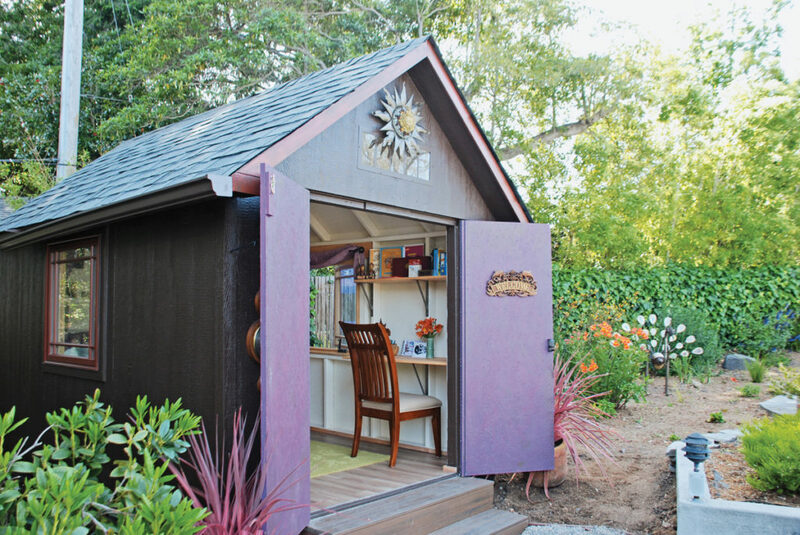 There are a number of uses for the she shed, including a home office, an art studio, a yoga studio, a quiet spot to read or write and a cozy place to entertain friends. Kotite herself has a simple 6’ x 6’ shed with a comfy chair, a lamp and all of her favorite books. She noted that, for many people, it is a need that starts young. In addition to the psychological benefits of a she shed, there are practical advantages. Sheds offer enhanced property value, extra room for living and working, and an attractive element that adds to your backyard landscape. Kotite said real estate agents are showing interest in the movement, highlighting sheds in property descriptions and pointing out when yards are large enough to accommodate one. The next question is, is it within your budget? The average custom-built she shed costs between $15,000 and $20,000. While this is about half of what it would cost to add a room to your house, it is still a big investment. Kotite said there are some tricks to keep costs in check. As the two biggest costs factors are materials and labor, the first suggestion is to take some time to collect your materials. Look on Craigslist or scavenge around for odds and ends like vintage bricks, old barn wood, and cast-off windows. 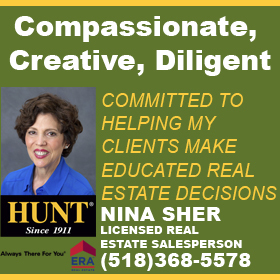 “They can make for a really cool looking shed and a lot of times they are cheap, especially in [upstate New York]where there are a lot of historic properties, and some of them are falling down, and a lot of those elements are thrown away,” she said. Once you have a cache of materials, ask yourself if you or anyone you know has building skills. If so, get as much free labor as you can and host a party similar to an old barn-raising. “If you are really lucky, you can build a nice shed for $2 or $3,000,” she said. Another option is to use a kit shed, purchased from a home improvement store. Those average $5,000 to $7,000 for a 10 X 12-foot structure. But Kotite discovered the hard way that the kits do not include any roofing materials, which will add to your expense. Furthermore, they do not have the charm and individuality of a custom-built shed. Kotite recommends improving the look of a kit shed by swapping the standard door for a “cool French door” and giving yourself big windows. The next considerations are whether your property will accommodate a she shed and if there are any community codes or Homeowners’ Association rules to get in the way. If your answers are “yes” and “no,” respectively, it is time to select a site. Kotite said that in an ideal world, the she shed is built on a small rise of land, far enough from the main house for privacy, surrounded by mature trees and gardens. In the real world, look for a spot where the ground is level and drainage is not a problem. Think about the distance from the main house and choose a location that close enough for convenience but far enough for privacy. Try to think like a landscape artist. Kotite advises that the best shed placement considers the entire back yard, including light, setback from property lines, and the ability to open and shut the door. A shed can also create a barrier between your yard and a neighbor by filling in a gap in a fence or line of trees. Once you have gone through all your due diligence and asked yourself all of the important questions, you are ready to design your she shed. The four walls—custom-built or kit—are just the beginning. The whole shed, interior, and exterior should be planned out before you actually start building. There are a number of choices to be made. In the Northeast, one of the first things to consider is the weather. Whatever you decide, the exterior walls are a vital part of the shed’s architectural appeal as well as its durability. The materials you choose and how you use them will define your shed’s style. In She Sheds Style, Kotite notes that metal, concrete, stone, wood and even synthetic components each offer properties of strength, protection and design appeal. Wood, for example, brings stability, strength, and style. Metal is a good option for roofing because it protects against rain. The entrance to a she shed should be warm and inviting and match its overall style and purpose. Doors should be sturdy and easy to open, but also attractive. Consider double French doors or Dutch doors for a romantic look, or doors crafted from old barn wood for a more rustic appeal. You might even find a unique vintage door at a second-hand shop. A plain door can be spruced up with a crystal doorknob or brass hinges. The area around the door should be as carefully designed as the structure itself. Possibilities include fencing, shrubbery, and a garden. It is now time to move to the inside. 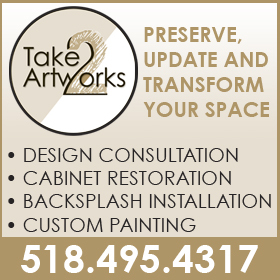 According to She Sheds Style, the best place to start your interior designing is with a scaled space plan. Make a simple drawing, with one square inch representing one square foot of space. Place your larger furniture pieces—tables, chairs, desks, etc.—first and build other elements around them. Think about how you will be using the shed. 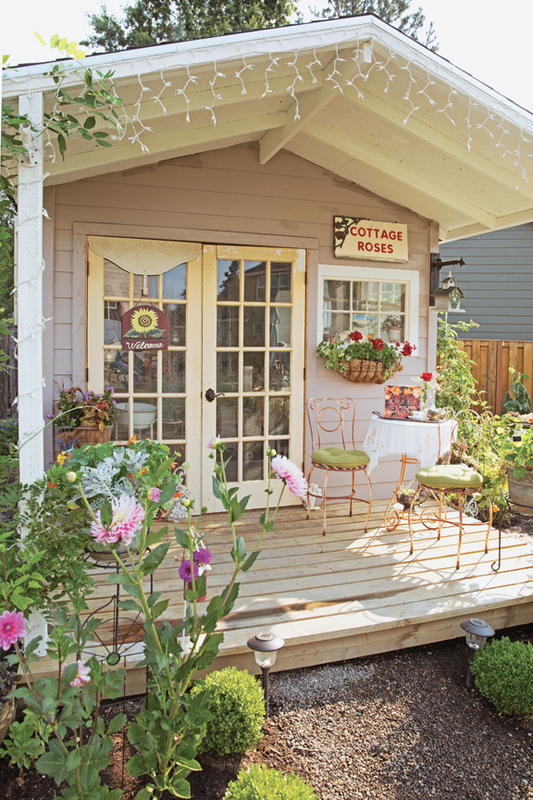 A gardening shed needs spots for plants, tools and so on. An artist studio needs an open floor plan and lots of natural light. A reading spot needs a comfy chair, a lamp and maybe a footrest. Plan what will go against your walls—bookcases, storage cabinets, what have you—before you plan your windows. Consider built-ins, such as shelving and cubbies, to save space. If you have a lot of items to store, you may even think about a “built out,” such as a small closet behind the shed. Another decision involves what kind of flooring you will have. Considerations include overall style, use, endurance, difficulty to install and budget. A wood floor may be attractive but could allow moisture to seep in. Kotite recommends raising the floor on wood supports. If your shed is on a dry, level area, consider a concrete foundation. You can leave it alone or cover it with vinyl, tile or carpeting. “The cool thing about a shed is that it is so small that if you select carpeting or other flooring that is kind of on the pricy side per square foot, you only need a small amount,” Kotite said. You will also want to think about your ceiling. Remember, if you are using your shed as a place to unwind you may be looking up a lot. The structural elements of a ceiling can become part of your decorative scheme. For example, trusses and crossbeams are perfect for displaying textiles, hanging plants or stringing lights. Lights (as well as space heaters, laptops, and many other necessities) require electricity. This is not a topic Kotite addresses in her book, but she said in an interview that most women use an “RV plug” rather than hard wiring. The colors, furnishings and other details of your shed give you the most opportunity to infuse it with personality. Kotite advises taking your time with this stage. When it comes to choosing your color scheme, start by thinking about what you don’t want. Once those shades have been eliminated, purchase sample sizes of any colors you are still considering. An eight-ounce can cost less than $5 and will allow you to see what the color looks like in your shed’s lighting. Invite your friends over for a painting party to get their opinion. To pick an exterior color, first, decide if you want your shed to blend into its surroundings or stand out. As for internal colors, remember that lighter colors reflect light, reduce shadow and give the shed a more spacious feel. You may also want to think about the therapeutic value some colors have. Blue, for example, is said to have a relaxing effect. Décor may include a pretty accent rug, art objects, mirrors, signs, flowers, wall hangings, whatever speaks to you. Furnishings will be determined in large part by the purpose of your shed but can still have some personality.